It seems that I can’t go a day without mentioning Manchester doesn’t it? This time though, the focus is solely on food. My favourite subject. 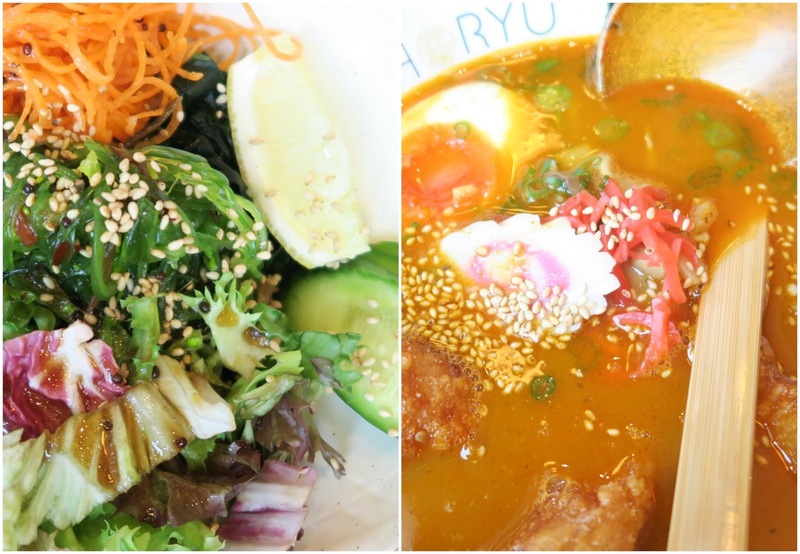 Recently I was invited to pop up to the new Shoryu Ramen, which has opened at Piccadilly Gardens. Nestled just near Ask Italian, the restaurant may be small in appearance, but it’s pretty big in the flavour department. The menu itself is fairly simple. You can choose from a selection of Ramen dishes for your main course (for those not in the know, Ramen is the type of noodle served in the broth). You can choose to have your Ramen in a variety of ways, from a firmer noodle to a really soft noodle. The choice is yours when you order. Before I went, it was recommended that I try the steamed buns. I’ve had steamed buns before and didn’t reeaaaalllly rate them, In retrospect, it was most likely due to the fact they were filled with really poor quality pulled pork. Fast forward to the steamed bun amazingness I tried at Shoryu Ramen and I feel awful that I ever doubted their steamy goodness. With marinated pork belly, complimented with a creamy, tangy dressing, the flavours that this little bun held were absolutely phenomenal for something so small and simple. For the main course I chose the Curry Ramen, which was playing it a bit safe really! My dining pal went for the Piri Piri Ramen which came with a nice, warm kick to it. Both were packed full with fresh vegetables and were delightfully seasoned with authentic herbs and spices. Each element was cooked perfectly. From the crispy battered chicken in my curry version, through to the egg placed on top of both. Even if the open kitchen wasn’t there for you to see the chefs creating the dishes, you wouldn’t have doubted that each dish was made completely fresh for you, rather than poured from a massive pre-made vat. Considering that each table was heaving with people and the lunch time rush was in full swing, we waited no longer than 20 minutes for the main courses. If you just wanted a light lunch, you’d be better sticking to the delicious buns than going the full hog with the Ramen mains though – I struggled to eat half of mine, as it was such a massive bowl! So definitely worth the prices which hit around £12 per main course. We ended up having to skip dessert, so I couldn’t possibly comment on the quality of those… But I can say I am eyeing up the Matcha Cheesecake for the next time I visit. Overall Shoryu Ramen in Manchester is a massive win, not only with the delicious, fresh food, but also with the atmosphere. Each time anyone walks in to the door, the entire waiting staff and chefs should the traditional Japanese greeting ‘Irasshaimase!’. which adds to the welcoming vibe of this new addition to the Manchester restaurant scene.